I began to photograph during my first years as a climber. I wished to capture not only the beauty of the mountains but also the arrival on the top or a particularly dangerous climbing. To me at that time photography was a means of documentation of a natural habitat or an evidence of the positive result of a difficult ascent. Obviously the blue of the high altitude sky, the intense variety of colours of a sunset or the dazzling reflections of a glacier were perfect subjects for colour photography. 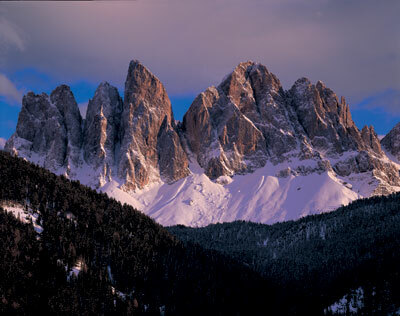 For many years I hiked in the Alps with a small, very light camera, which I kept in my backpack or hung to my harness. And to be honest, when the main goal is to climb a overhanging rock wall or to reach the summit of Mont Blanc along vast frozen walls full of seracs, the weight of your backpack becomes a key factor and an obsessing concern. 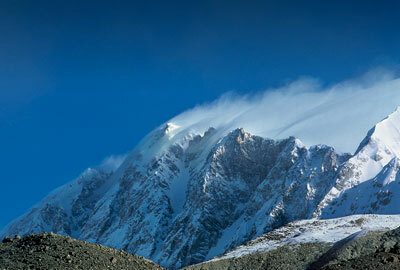 Thanks to Himalaya and Karakorum I began to have a less utilitarian relation with photography. The wonderful photos by the Japanese Shiro Shirahata, made in Himalaya and Karakorum with a large format view camera, and published in two outstanding books, impressed me immensely. For the first time I was revealed a purity, a luminousness and a sense of perfection that I had never seen before. At that time, though, climbing was still so totally involving for me that I could not yet allow my camera to play the protagonist´s role. It took me many years to let this happen, and the transformation from climber to photographer could begin thanks to Shirahata and the large format view camera photography. One afternoon, back home some weeks after my unlucky expedition to Annapurna I, pacing up and down my Milan home lounge while thinking about Shirahata´s pictures, I took the instinctive decision that I wanted to try to capture that magic that had recently been revealed to me. A few months later, with my new Linhof, her big 4×5″(about 10×12 centimeters) films and eleven lenses, I found myself on a Mont Blanc trail. My backpack, which was about 30 kilos, weighed as much as the many I had carried in my climbing career, but this time it contained a new vision. Our life is a continuous evolution and every new experience brings about a new inner enrichment, a deeper awareness, an unprecedented perspective. To make colour pictures of the mountains was my first step towards a more complete way of feeling and giving expression to my world, towards a perception of photography that only years later was destined to give voice to my soul in a more mature way.